CAJ teachers seek to integrate biblical truth into everything they teach. This means students wrestle with what the Bible teaches in classes other that their Bible class and in every division of the school. In fifth grade we are beginning to investigate mixtures and solutions. Solutions are a type of homogeneous mixture, where the components cannot be easily separated once blended. How do the students see God in what we are learning? 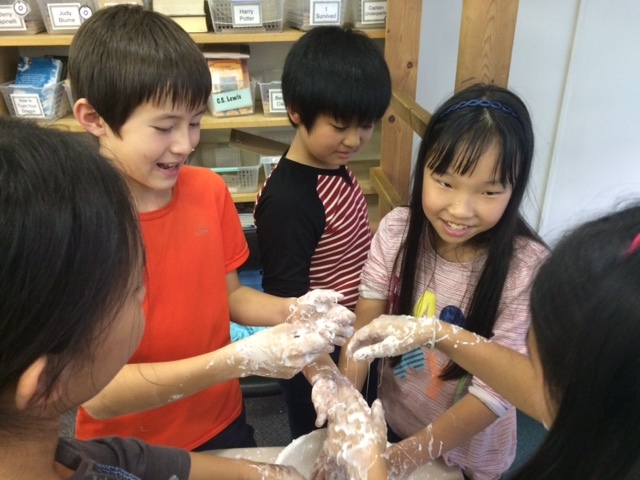 Well, after mixing cornstarch and water to create Oobleck, we wondered what we had. After blending the components, the concoction stiffened when held, then dripped through our fingers until it dried up on the table. Although it blended as a solution should, it also separated as it dried or was left alone. One student described Oobleck as when we touch it, and then release it, it’s like when we do something good, we stick to God. When we release from Him, we fall apart. Another thought, without God we can’t make these things. Many could easily see that there must be a creator of the things we see. Soon, we will create crystals with baking soda and see God’s hand in the beauty of these tiny elements. In seventh grade, students prepared “A Day in the Life” presentation, following reading the short story “A Day’s Wait,” by Ernest Hemingway. In the story, a boy spends all day worrying about his sickness, fearing he will die soon. In the end, we find out it was all a misunderstanding; he is fine. After reading the story, we asked ourselves, “How do we spend our time?” and “How should we spend our time?” The students reflected on the usual parts of a typical day that they experience and examined how their time is spent. When they actually wrote out what they did throughout the day, they realized their time was not always well spent, and there were conflicts in their lives. Some of the conflicts shared were time management issues, anxiety, and conflicts with others including friends, siblings and parents. After identifying some conflicts, the students opened their Bible to see what the Bible says about their conflicts and how they could make plans to resolve these conflicts. Then, the students prepared a 4-6 minute “A Day in the Life” presentation to share with their classmates. After sharing about her anxiety towards schoolwork, one student explained how the Bible talks about casting all anxiety on God (I Peter 5:7) and not be anxious about anything (Philippians 4:6). Then she said, “I need to remind myself that God is greater than my anxiety.” She also made a plan to pace her assignments out so she would not have to worry. Another student shared that one of his conflicts was that he would argue frequently with his sister. After reading Proverbs 15:18, which states, “A hot-tempered person starts fights; a cool-tempered person stops them,” he realized that he would need to be more patient with his sister, and he could be the one to stop the argument. 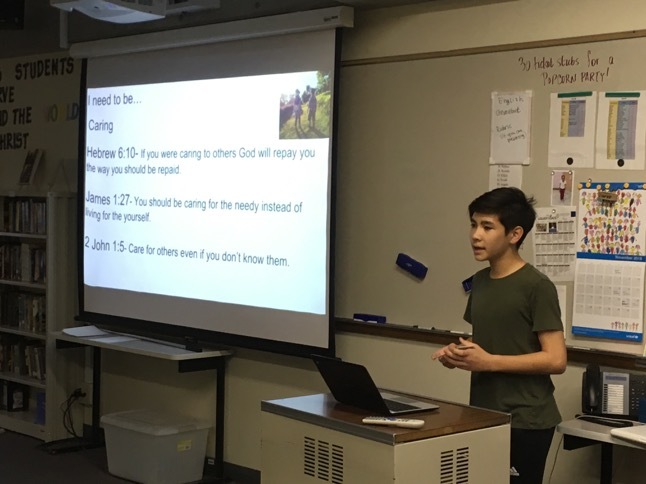 The Bible teaches us how we should live our lives, and 7th graders learned to connect the Biblical teachings to their lives as they reflected on their lives and made goals and actions plans. Is justice about protecting individual freedom? Is it about benefiting the majority? Is it about upholding virtue? 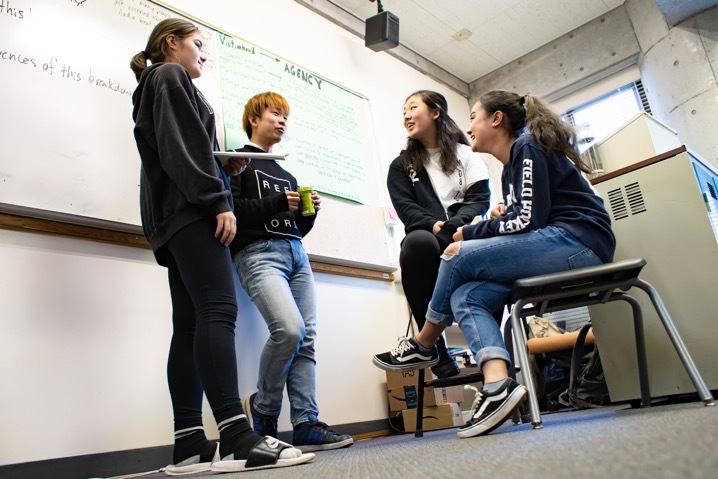 My 11th graders start the school year with a host of different assumptions about what justice means, and how it is shaped by media, culture, and society. With so many competing visions for what justice is, how can we as Christians responsibly and consistently follow God’s call for us to do justice? These are the questions that loom over us as we start each new year in Humanities 11-- a blend of U.S. History class and English class. To establish a foundation for the year to come, our first reading assignment is a pair of chapters from two different authors: one from Generous Justice by Tim Keller, the founder of Redeemer Presbyterian Church in New York City, and one from Healing for a Broken World by Steve Monsma, a former politician and Senior Research Fellow at Calvin College’s Henry Institute. As the students read, discuss, and reflect on these chapters, they recognize a common definition of justice: giving people their due as image-bearers of God. Throughout the first unit, we strive to unpack what this means so that we can refer back to this definition in coming units, applying it to such diverse topics as the Salem Witch Trials, the writing of the Declaration of Independence, slavery, the dropping of the atomic bombs, and more. My hope each year is that as students study history and literature with this overarching theme of justice in mind, they will find themselves asking what it means for them to give others their due as image-bearers in their lives at CAJ and beyond.